Does this book still matter? Today, that well-dressed man would stand out in a crowd. 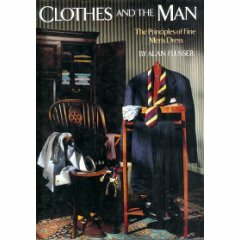 So the question is raised, do clothes continue to “make the man?” Or do people in general really not care how they look to others? Holding to my theory that the eye can be trained to spot the beautiful and sublime, I like to go for walks, read magazines, watch movies, visit the museum and generally soak in the world around me. And if there is one thing that continues to jar my senses, it is our state of “non-dress,” for lack of a better term. Yesterday I visited my local coffee roaster for a fresh supply of espresso beans and was greeted by: “Suit Guy! Hi!” It’s been two weeks since I was last there and either business is dismal, or I am the only person to have darkened their doorway wearing a suit in that time. And they are located in the city! I suppose all the “suits” go to Starbucks? Or are they non-existent? Who still dresses? TV anchors, some Doctors, Lawyers, Bankers, Lobbyists, Politicians, Investment Advisors and Insurance Salesmen. Why do they still insist on wearing suits to the office and to client meetings? Because they want to be taken seriously. They are about to ask for money and/or your vote. But what about after work? I’m afraid to ask. So why do you dress? Do you have to? Or do you want to? And why? Would you want to stand out in a crowd? I’m starting to believe that my small part of the revolution may be fighting a holding action for the well-dressed. I’m not sure we will ever go back to the days when men wore suits during the day and black tie for evenings out, and women had three different lengths of dresses and skirts to choose from depending on the time of day they were to be out and about. And that’s not even counting the popularity of the Hepburnian menswear look that can look dynamite. Maybe it’s a good thing that we aren’t so rules-bound. But I think we are missing out on the elegance of everyday life. It’s time to retrain our eyes. So here’s your assignment for today. Find a very well-dressed person or photo of a person and ask yourself “why do I find this person to be well-dressed? And how can I emulate the way (s)he is dressing?” And then, if it fits into the budget, buy something new to reflect your newfound aesthetic knowledge (whether for yourself or your significant other.) Or put your clothing together in a different way. Then, save up and show off your new look at a dinner out. You might be helping to develop someone else’s aesthetic.